You know someone for almost 30 years, and only now discover the hidden, almost-mystical side to them. My Mumbai-based friend Lakshmi Narayan has just published her second book (& here’s a link to my review of her debut novel) and what a revelation it is. “Whisperings from Beyond” is a collection of thoughts, precepts, call them what you will, one for each day of the year, making this a book to keep by your side and dip into regularly. Now that’s the Lakshmi I know! Articulate, no nonsense, and delightfully self deprecating. The author offers us a thought – more like a short reading – for every day of the year and on opening the book, I turned straight to my birthday reading. There are thoughts on topics as varied as money, value systems, resisting temptation, negativity…something for everyone, which is part of the appeal of this book. You can dip in and out, and always find something to make you think. A good-looking book, attractively presented. 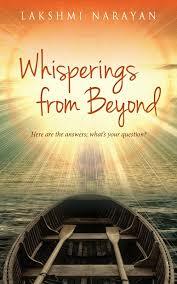 Published in 2017 by Hay House, “Whisperings from Beyond” costs Rs399. You can order it here, by clicking on the link…but, hey! You all know how to do that without any explanations from me, right?